Home>Posts>Bring your family and visit EDC’s stand during “6 Noc w Instytucie Lotnictwa” – free entrance for all guests! Bring your family and visit EDC’s stand during “6 Noc w Instytucie Lotnictwa” – free entrance for all guests! 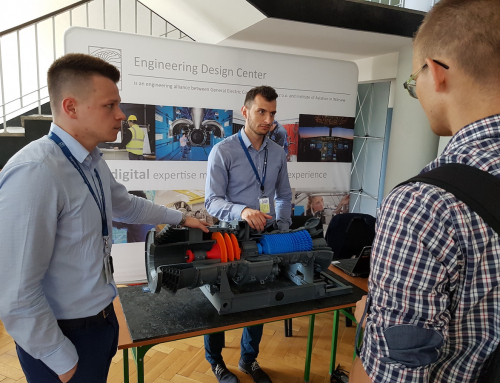 On the October 16th we would like to invite you to visit EDC stand during one of the biggest educational event for the aviation fans – “6 Noc w Instytucie Lotnictwa”. You can not miss the chance to spent a great evening with your family and see many attractions and surprises which we prepared for you! All GE businesses are involved in creating visualizations presenting their specific way of work at a stand themed “From an idea to a product”. To get a close-up on an engineer’s everyday routine, we offer you an exciting visit to laboratories such as Repair Development Center, High Pressure Laboratory, Materials Technology Laboratory, Component Test Laboratory, and Engine Training Laboratory. Every lab prepared special presentations and information for its guests. This is not the end of amazing things waiting for you at “6 Noc w Instytucie Lotnictwa”. The main theme of this year’s event will be the exploration of the outer space. There will also be many attractions connected with widely defined aviation. If you are ready to explore the cosmic power enchanted in the night sky, feel free to join any other activities available at that time. A marvelous illumination and plenty of interesting guests are going to make this night a blast! More information is available at the official Noc w Instytucie Lotnictwa website, as well as on its facebook profile.